After spending more than half of his 40 years on earth in a Major League Baseball uniform, Ken Griffey, Jr. doesn’t want to give up the game that’s made him a household name and a future Hall-of-Famer. And baseball fans everywhere, especially those in Seattle, want Junior back next year to see him continue his climb up the all-time home run list. The man known most of his career as “The Kid” made a convincing case for a farewell tour in 2010 by clubbing three home runs during The Mariner’s last home stand to bring his career total to 630. 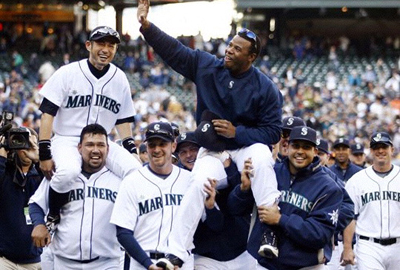 With the Seattle crowd cheering “One More Year,” Griffey also got a hit on his last 2009 at-bat and was humbled by having his teammates take him for a victory lap on their shoulders after their 85th win of the season. He hopes it’s not and believes he can still contribute as a player. “I had a whole lot of fun doing something not many people get to do, which is play baseball for a living," said Junior. "Now, we'll see what the next chapter is about." Griffey is both one of the most prolific home run hitters and best defensive players in baseball history, fifth on the list of most career home runs with the most home runs of any active Major Leaguer, and is tied for the record of most consecutive games with a home run – eight (8) between July 20 and July 28, 1993 during his first Mariners stint.